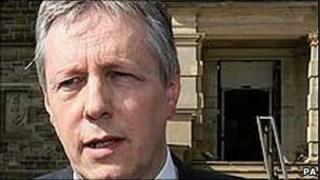 Northern Ireland First Minister, Peter Robinson, has said 2010 will be remembered most by the "challenges to our economy". However, Mr Robinson said NI people were "strong in adversity" and he was confident that through hard work the region would "weather the storm". In his Christmas message, the DUP leader said Northern Ireland was "moving forward" and a start had been made to transform it into the "great place it can be". Mr Robinson paid tribute to the soldiers, police officers, emergency services and hospital staff who will spend Christmas Day away from their families. "I thank them for their dedication and service," he said. "In particular, we should think of those families who will have an empty chair this Christmas through the death of a loved one on the battlefield. "I pray they will know God's love and peace in a very special way."